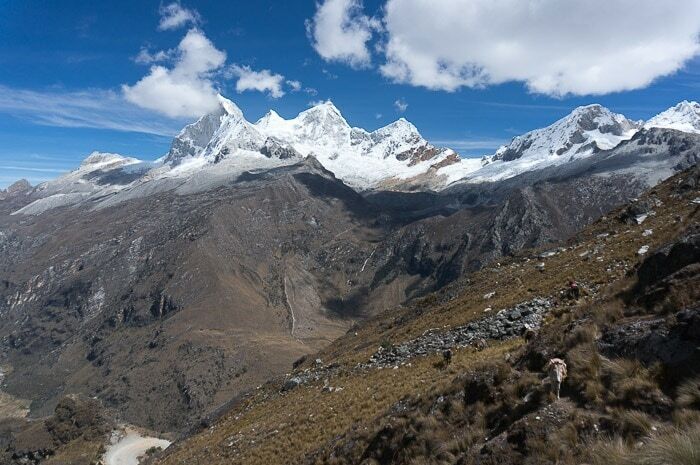 I knew there was no way I could go to Huaraz without doing a little mountain climbing in Peru and putting in an attempt in the Cordillera Blanca. 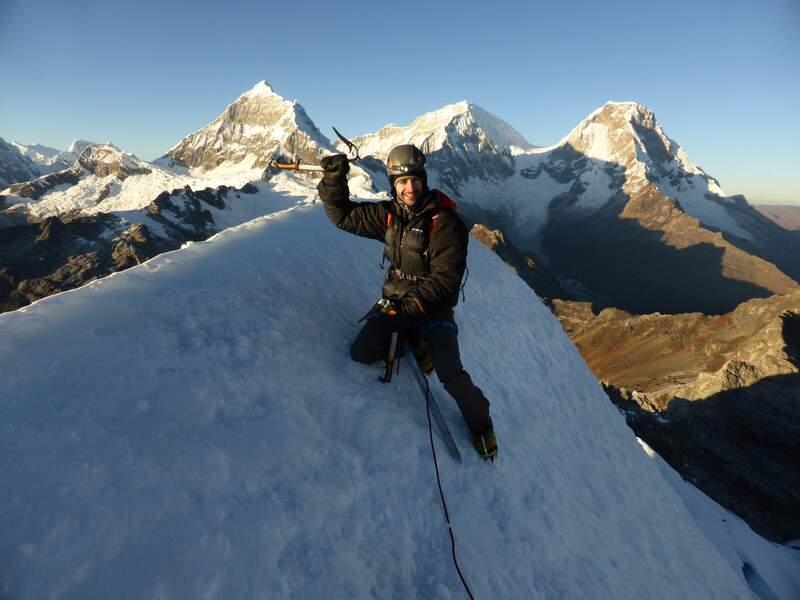 To date, my highest summit remained Mount Whitney via the East Buttress route, although I’d trekked up to higher altitudes in the Colombian Andes. 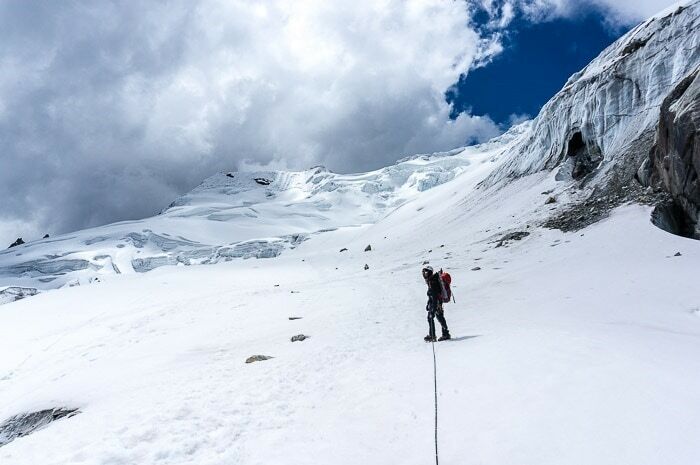 When it comes to mountain climbing, I’m somewhat out of practice, out of shape, and don’t have any climbing partners here in Peru, so I knew whatever I did, I would be looking at a guided climb. 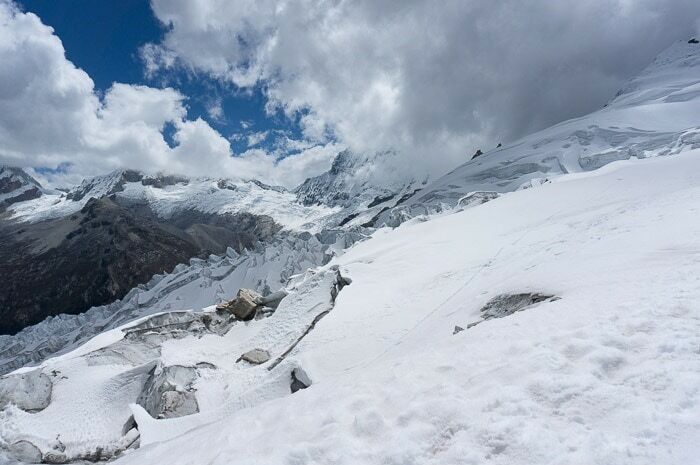 Many people opt to climb Pisco, which is considered one of the easiest climbs (albeit at altitude) in the Cordillera Blanca. 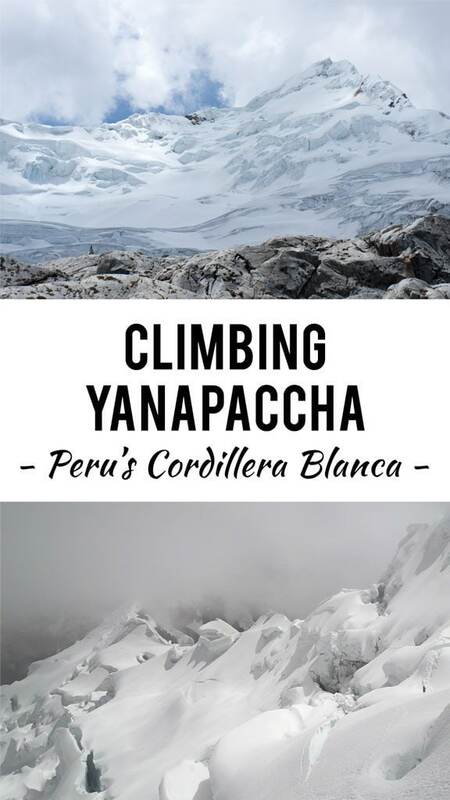 I wanted to try and get up something that was at least a little more interesting than a walk up, so I set my sights on the 5,460 meter (17,913 feet) Yanapaccha (pronounced “Ya-na-pack-chah”. 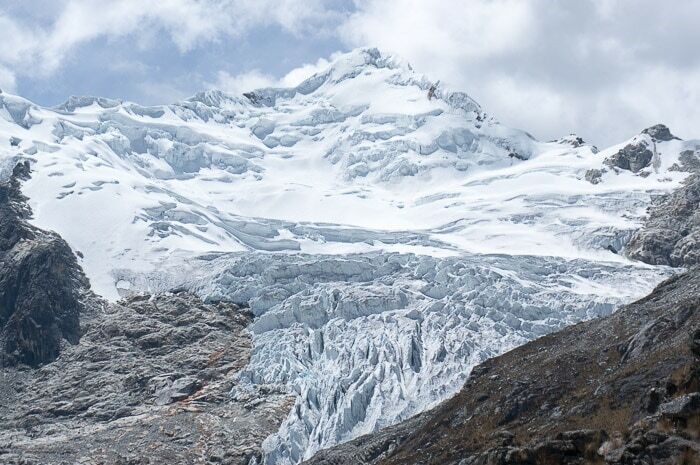 I’d actually never heard of this mountain before setting foot in Huaraz, but trip reports promised at least a pitch of steep snow/ice climbing to reach the summit ridge, which would require the use of two ice tools. 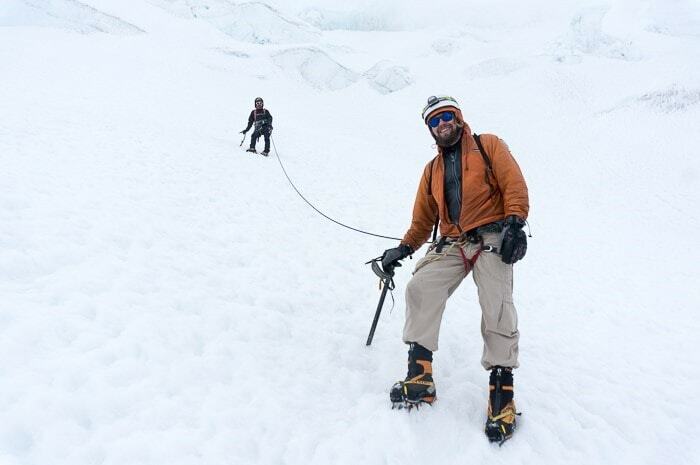 I spent a lot of of time ice climbing in Ouray, Colorado, so this sounded perfect! I wanted to try and join an existing group so it would be a little cheaper for me rather than going 1:1. 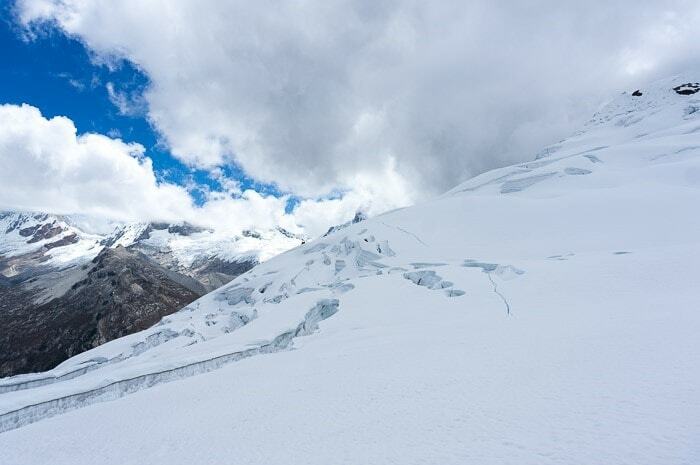 I’d spent quite a bit of time in Huaraz (don’t miss my guide to Huaraz, Peru), but when I knew it was time to find a climb I headed down to Parque Gingebre to speak with various agencies. There are a handful of agencies in this area so I went around and talked to each one. 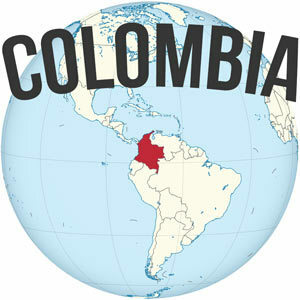 Some agencies were just plain rude, others didn’t have any groups heading out during the dates I was looking for, and just by luck, one agency had a couple ready to go for Yanapaccha. 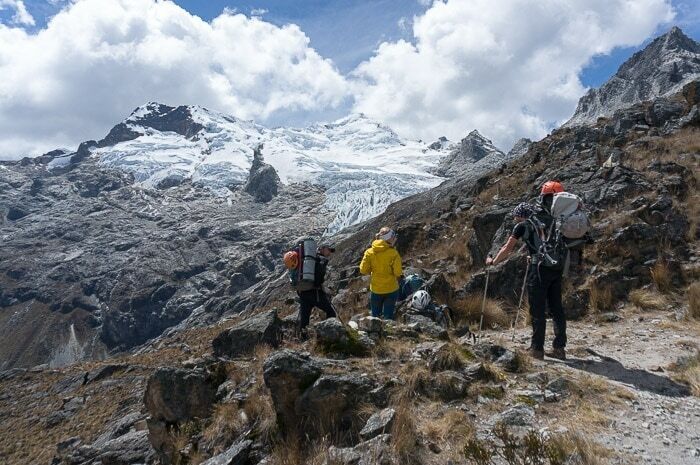 I decided to join a quick two day, one night trip to Yanapaccha with Andean Kingdom Huaraz. I didn’t have all the gear for mountain climbing with me, just the most basic camping gear and outdoor clothing. 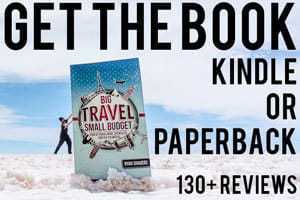 Thankfully the trip price included everything, along with whatever gear you needed, from helmets, boots, crampons, outerwear, gloves, and beyond. 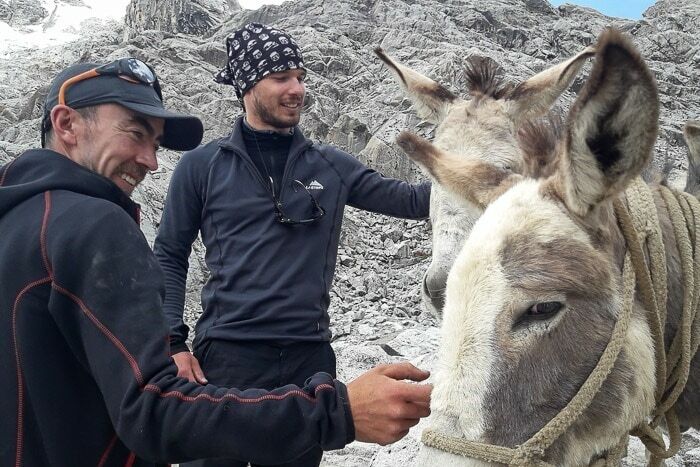 We met up the night before the trip so I could meet up with the other two clients (a couple from Czech Republic and Slovakia) as well as the two guides (the ratio was two clients per guide). 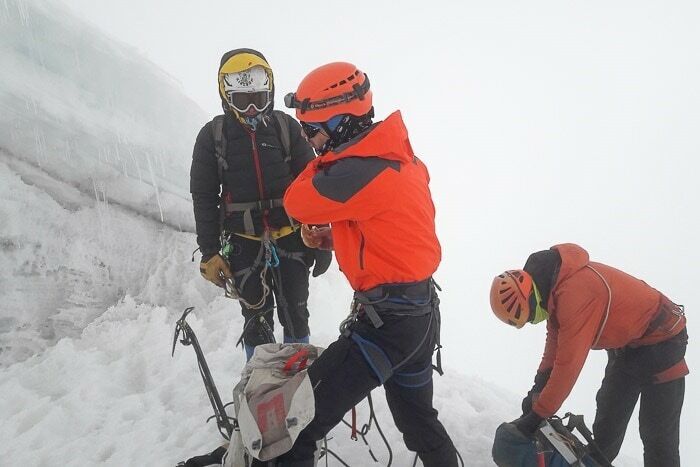 We’d be climbing with Jack, who was a local guide from Huaraz, as well as Diego, a guide from Colombia. I went over all my gear and we talked about logistics for the next day along before we all went our separate ways. The shuttle bus pulled up in front of my place at 6:30am, I said goodbye to Andrea and hopped in for the four hour drive to the trailhead in Huascaran National Park. 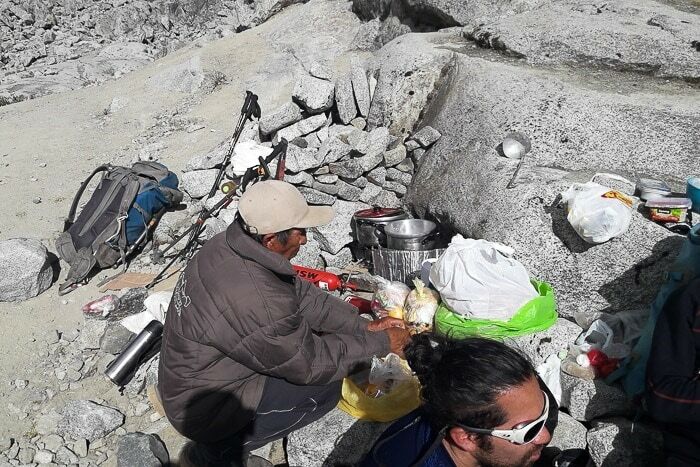 We were joined by Don Pedro, a 68 year old porter who would also serve as camp cook for the time on the mountain. I tried to get some sleep on the long-ride, since I’d already seen the beautiful scenery in the National Park. 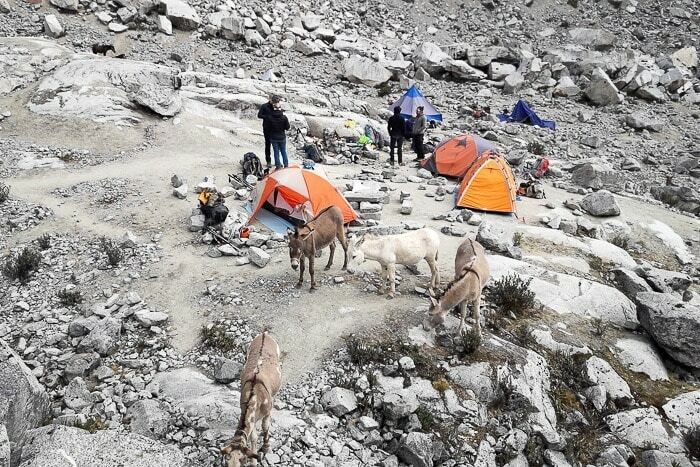 After pulling up at the trailhead, high above the Llanganuco Valley, we organized the last of the group gear. The guides and the 68 year old porter hauled the heaviest stuff, and I felt guilty, but they refused my offers to help. 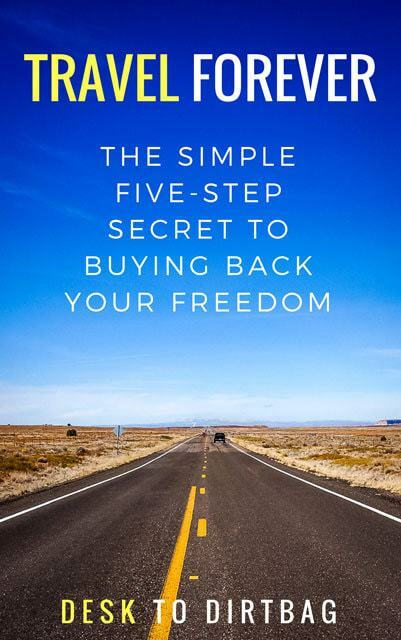 The clients basically only had to carry their own personal gear. It was a two hour hike to base camp beside a small laguna. 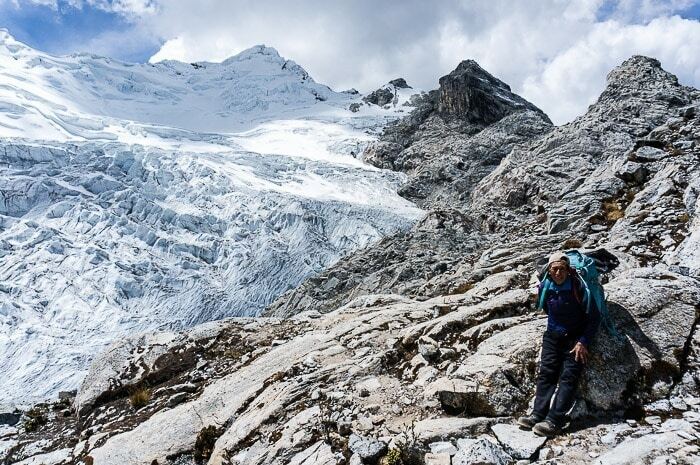 The hike wasn’t anything too extreme, indeed this climb has one of the shortest and easiest base camp hikes in the Cordillera Blanca, seeing very little vertical ascent, except for one particularly steep portion. Along the way you’ve got a great view of the Huandoy group, Laguna 69 across the valley, and the faces of Chacraraju and Pisco. 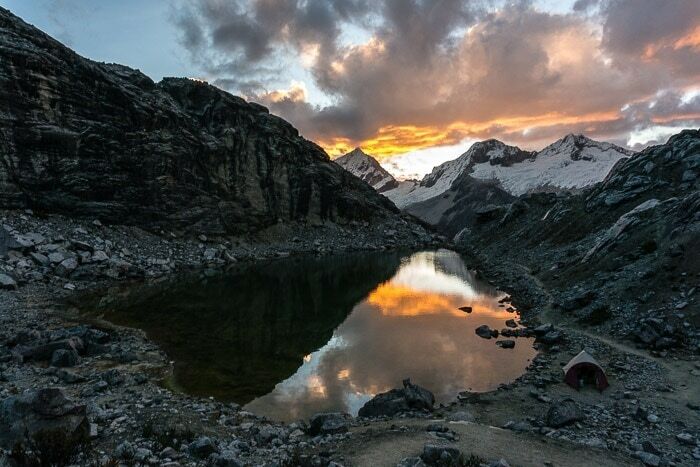 We set up camp above the lake and relaxed as we all snacked on our boxed lunches supplied by Andean Kingdom. The lunch for day 1 included an avocado sandwich, lots of snacks like cookies and crackers, as well as fresh fruit. Later than evening Don Pedro cooked up soup and a vegetarian arroz chaufa (like a Chinese fried rice), which was quite delicious. 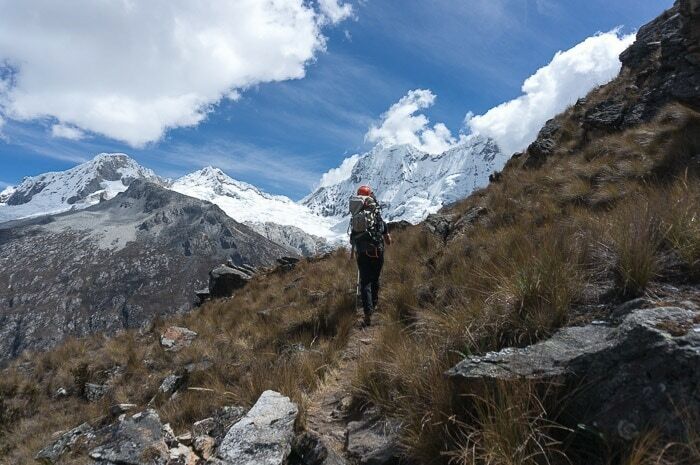 I hoped that I wouldn’t suffer from any altitude sickness, since I’d taken a break since the last time I was in the mountains on the Santa Cruz Trek. 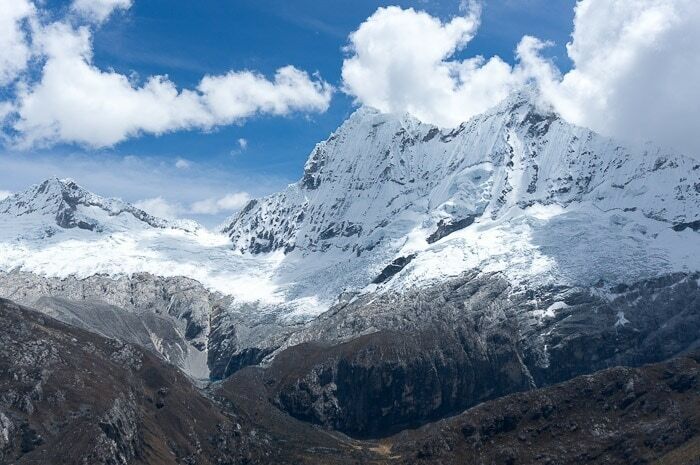 I popped an altitude sickness pill that I purchased in Huaraz just to be safe. And I gotta say that the view from the camp, particularly at sunset, were just incredible! 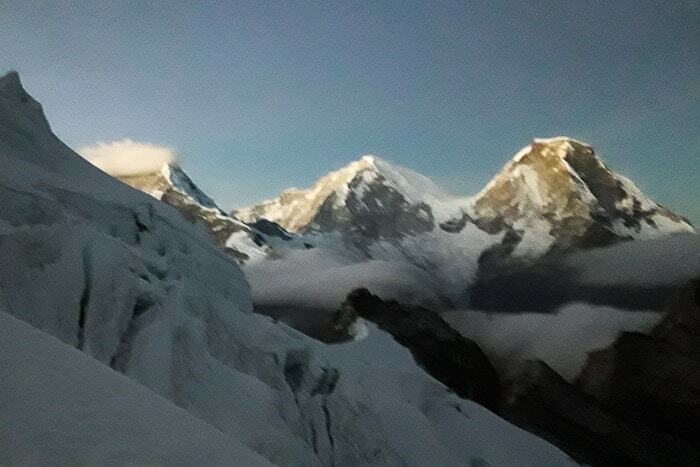 We were up before dawn the next day… I had a somewhat fitful night of sleep thanks to nerves and excitement, the altitude, and Diego’s snoring. Glad I brought my headphones at least. Breakfast was breads with butter and jam accompanied by instant coffee. 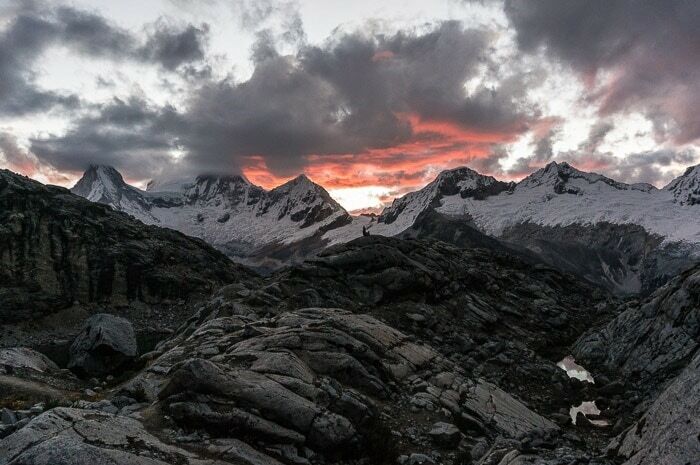 We set out along the rocky, rotten moraine by headlamp light, walking and scrambling over tippy loose rocks so we could gain the shoulder of the glacier. 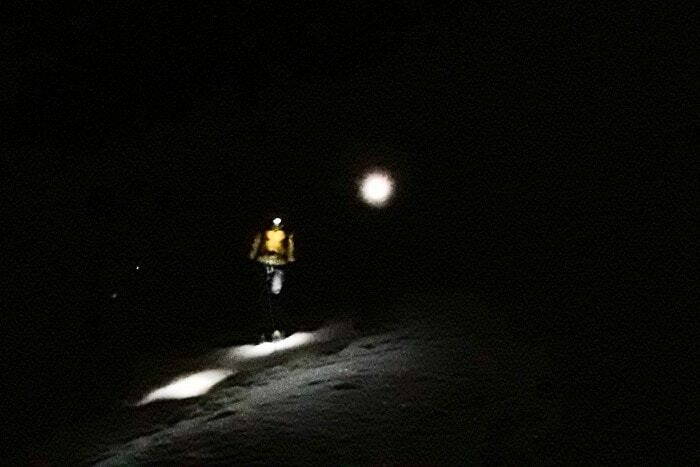 We tossed on our crampons and scrambled onto the snow and ice and began making our way up in the dark of night, accompanied only by the bubble of light from the headlamps and the cold, familiar crunch of crampons on snow. The route started out easy enough, flat, walking, but gradually ramped up in angle as we ascended. Then the terrain became extremely broken and circuitous. 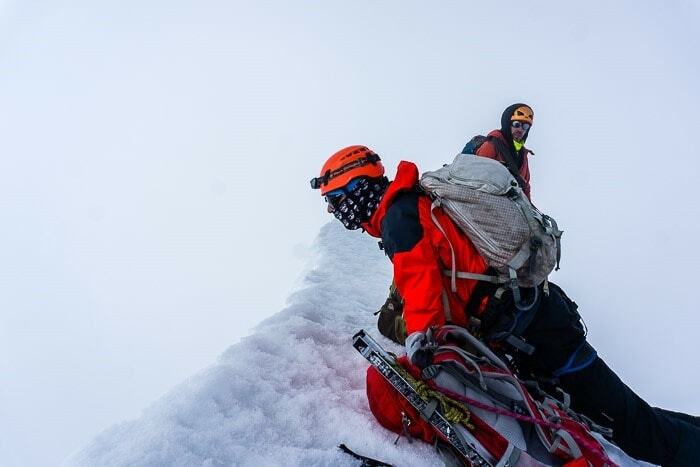 Indeed the route that the guides had taken earlier that season was now impassable… And now we found ourselves in the middle of the clouds, no view whatsoever, and freezing conditions. 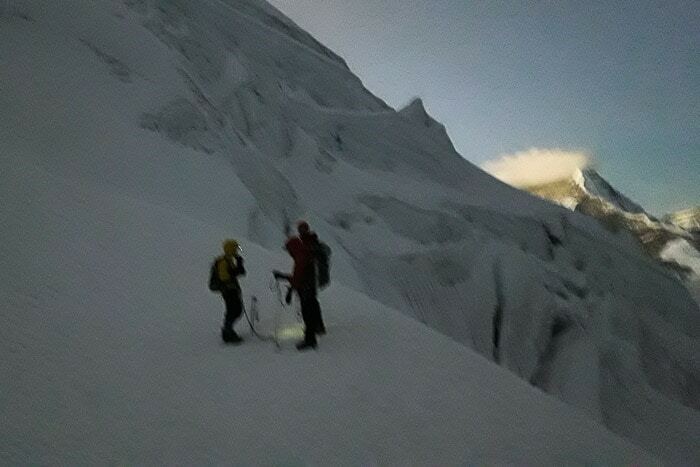 We had to traverse out onto the face of Yanapaccha, rather than gaining the left shoulder as they normally do. This meant steeper climbing and a lot more pitches. I grabbed my tool second tool and followed Jack up the mountain (the two of us were roped up, while Diego guided the other couple ahead of us). Amazingly this was the other couple’s first real mountain climb, so they were moving quite slowly… which meant Jack and I spent a lot of time standing around (even though we were another team, the two teams stuck together). 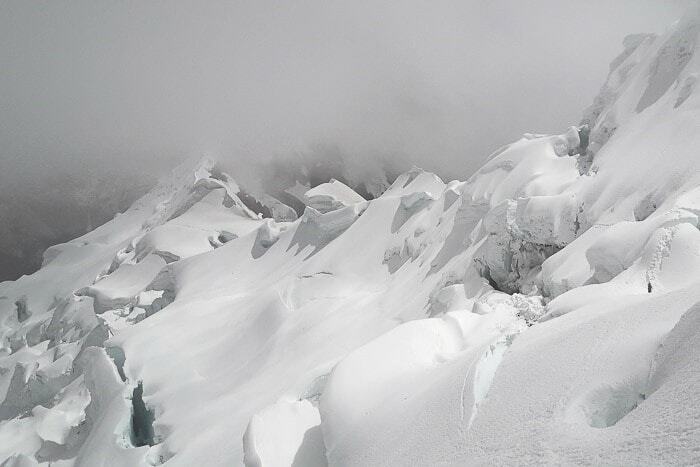 A few pitches below the summit, the girl from Slovakia took an ice block to the face… I was further below, but everything ground to a halt as Jack climbed up to her to take care of her winds. The cold settled into my hands as I hung back on the steep face. I felt the cold seep into my toes. Everything seemed to take forever. 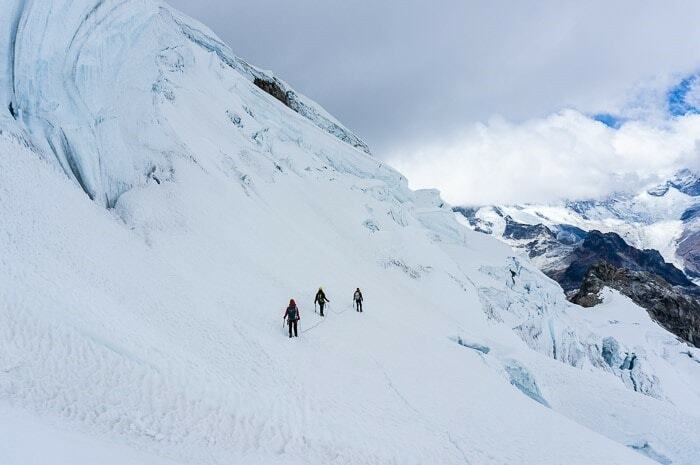 Finally the team ahead started moving again, and I climbed as fast as I could to warm up again, all the while huffing and puffing, stopping only to clean up the ice screws and pickets and taking a moment to catch my breath in the thin air. I felt like I hadn’t missed a beat since my ice climbing days. 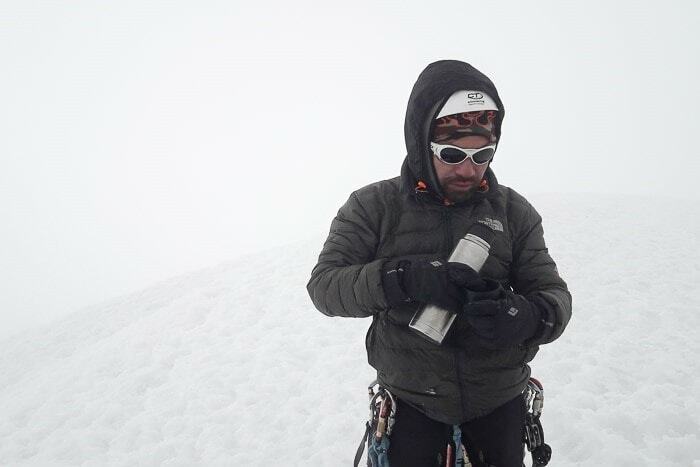 Indeed, the terrain seemed quite easy, and I felt like I could have lead any of the pitches (although route finding would have been tricky in the whiteout). 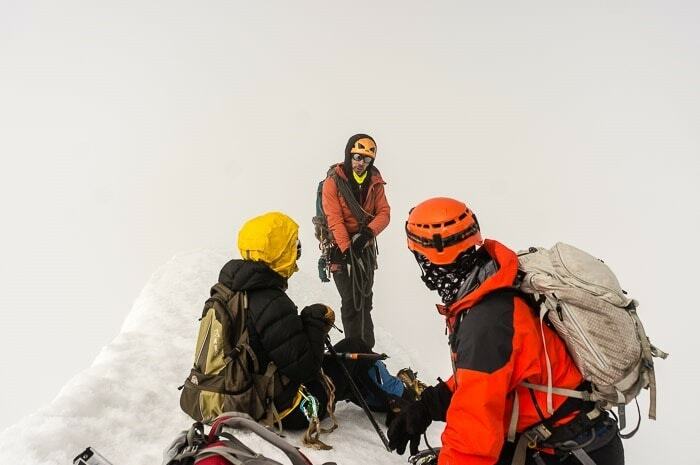 Then, after about three full pitches of ice climbing at around 17,000 feet, we arrived on the soupy, white out summit. The normally incredible summit photo was definitely not going to happen. But at least we got to climb up to the true summit (sometimes it is blocked by a big mushroom). We snapped photos of the nothingness and then prepared for the descent, after six hours climbing up. 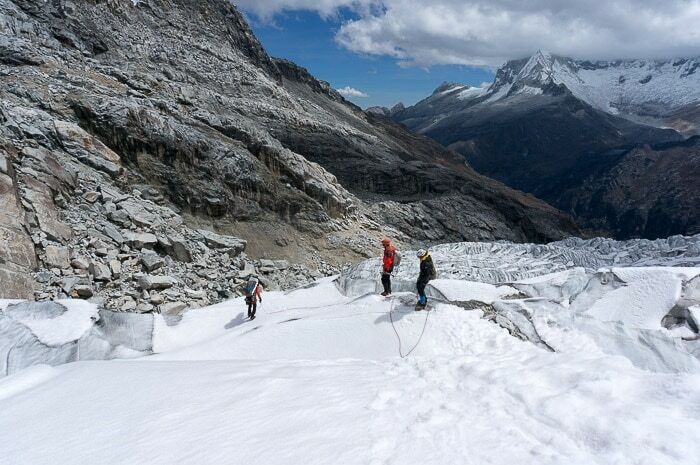 The descent was almost as agonizingly slow as the ascent… Requiring at least three rappels of our five person team. 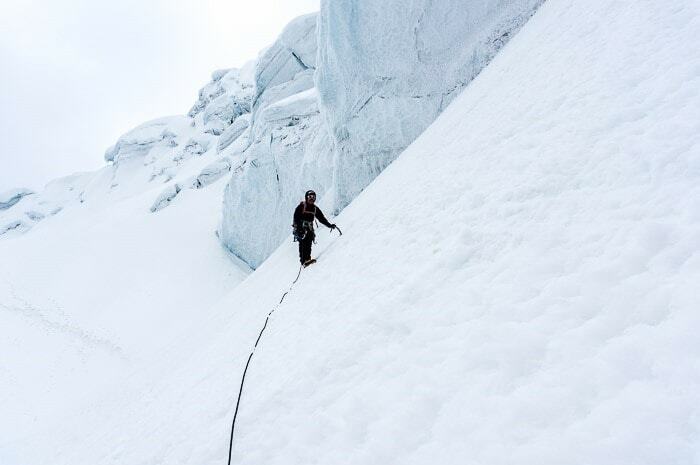 We rappelled the same way we ascended, but we were all stuck together at a tiny little rappel station, practically stepping on each others toes as V-thread rappels were constructed into the icy face. Finally we were back on walkable ground. Steep, but walkable. 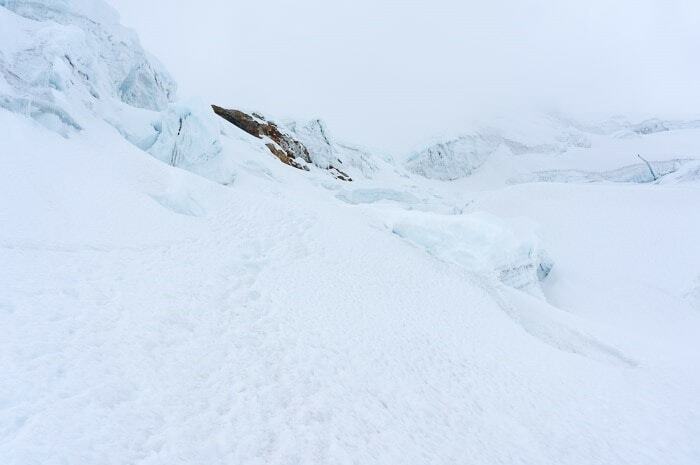 We retraced our steeps and emerged below the clouds to receive our first bit of warmth for the day on Yanapaccha. It felt so good. 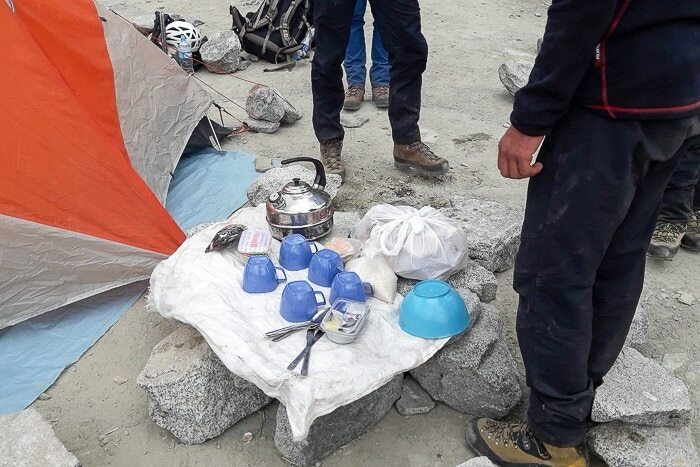 We finally returned to camp five hours after leaving the summit, where Don Pedro was waiting for us (long overdue) with soup and fresh guacamole with bread. I was absolutely ravished, and didn’t eat almost anything of the second pack lunch, so I ate that too, and chugged as much water as I could. It was a long, 11 hour, grueling day, and we still had to break camp and hike out. 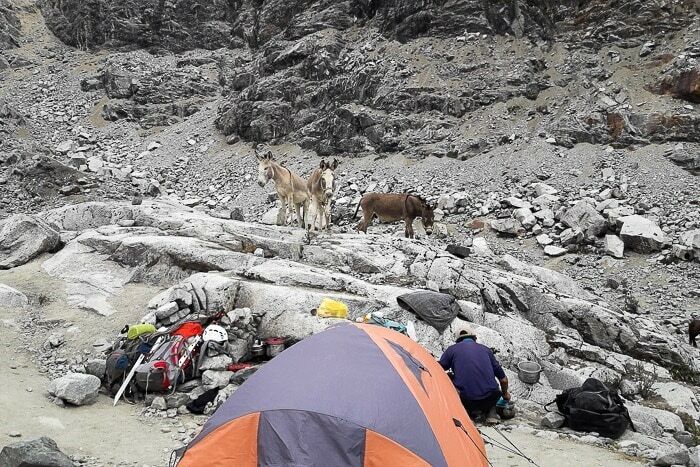 After Diego and the other team finally made it back to camp (we went our separate ways after leaving the glacier), we were eventually on the move again. This time I got loaded up with a massive heavy tent and more group gear for the hike out — so I didn’t feel so guilty this time, but rather much more soreness in the shoulders. I just wanted to be done, so I hiked out as fast as I could, with me, Diego, and the 68 year old Don Pedro leading the pack. I almost slipped multiple times on the steep sections that seemed to be made up of ball bearing rocks… And that’s despite the fact that I had “real” boots and trekking pools, while Don Pedro didn’t so much as flinch, with his regular leather work boots, no trekking poles or sticks, and (did I mention?) was almost 70 years old! It was incredible… So much respect for these old mountain men. Then finally we made it back to the comfort of the van and I collapsed into my seat, worn out after a long, 13-hour day, but happy to have climbed such an incredible mountain. 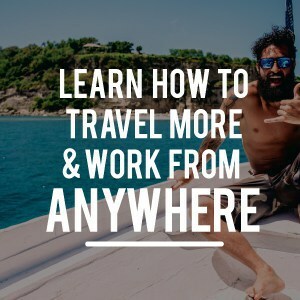 $350 for 2d/1n – everything included, transport, gear, guides, food, cook, etc.